When I first started reading comics, I exclusively read DC comics—I was so hyperfocused on reading about the superheroes dominating the box office that I missed out on the great indie comic series out there. As a result, I have a lot of comics to catch up on. I’m currently reading Moonstruck from by Image Comics, which is a great series with positive LGBTQIA+ relationships, and I’m also trying to be more aware of smaller independent publishers coexisting with the bigger comic companies. I recently discovered Mad Cave Studios after a friend of mine included Midnight Task Force issue #1 in a post on his website about his comic pulls for the week. This led me to have a conversation with Chris Sanchez, who is responsible for the digital media at Mad Cave. He gave me a rundown on the comics they are currently releasing. 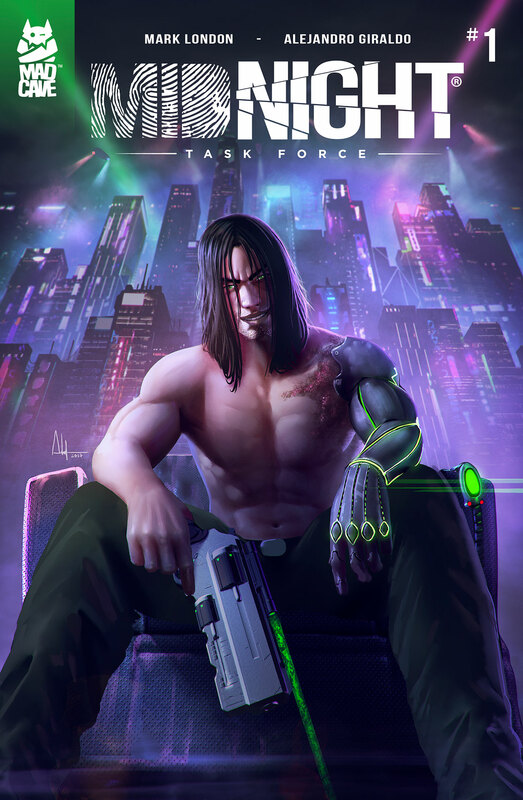 Midnight Task Force, the series I originally became interested in, is a cyberpunk series taking place in a dystopian Detroit that reminds me of Minority Report mixed with CSI. Aiden McCormick is a war-scarred detective aiding police in solving some incredibly gruesome murders; along the way, he has to battle with his own PTSD and internal demons to deliver justice to the victim’s families. Midnight Task Force had a four-issue run that has now been combined into a trade paperback. 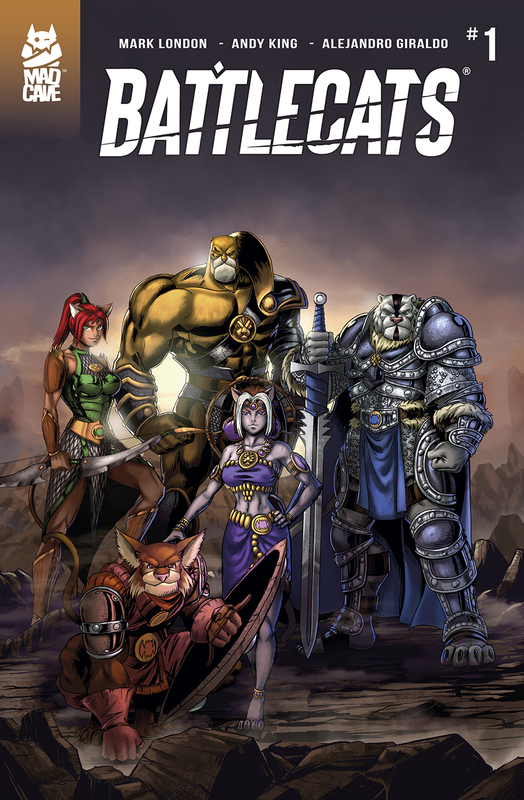 The second series that caught my attention was Battlecats, set in a medieval-inspired time period on a fictional world called Valderia. The Battlecats are fierce warriors dedicated to protecting the Valderia throne against civic unrest or another entirely different threat altogether. Sanchez says the Mad Cave Studios team was inspired by Thundercats, King Arthur, and Dungeons & Dragons in creating this one fresh story. There are five issues out in this series, which have also been compiled into a trade paperback. So far, I have read issue #1, and its definitely appeals to my interests. Who doesn’t want to read about huge lions battling it out? This cat lady was thrilled. 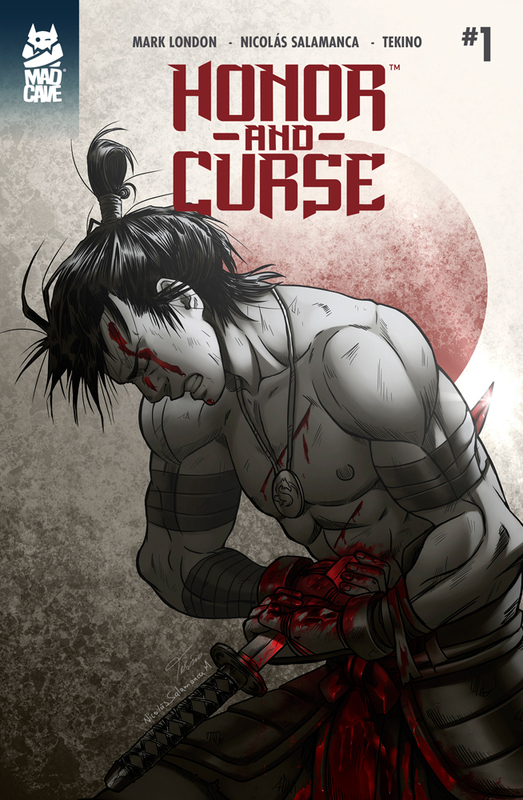 Mad Cave’s newest series is Honor and Curse, a series taking place in feudal Japan. Besides the setting, this series combines forbidden love, intricate battle sequences, and gorgeous colors to create one epic comic. The first two issues dropped in February and March 2019, with two more coming in April and May. There is also a fourth series, Knights of the Golden Sun, which describes itself as a biblical epic and is currently on its fifth issue. One reason I probably hadn’t heard of Mad Cave is the fact it isn’t located in the Midwest. Based in Miami, the publisher has set out to provide compelling and visually stunning art within its panels. Mark London is the CEO and chief creative officer at Mad Cave and the creative mind behind most of the comic series. I’m hoping that in the future, Mad Cave will add more writers to its roster—in particular, I’d like to see some gender diversity among the creators, as I didn’t see nonmale-identified writers in their catalog. Comics isn’t just a boys’ club, and I think it’s crucial for comic companies to include a mix of genders among their creators, which adds diversity to stories. Similarly, although each individual series has a different artist, which allows for each book to have its own unique feel, I still don’t see any illustrator who identifies as female or nonbinary on their books. There’s no denying that Minneapolis has a great comics scene. However, it’s good to branch out beyond the Midwest to see what other indie comics are being published. Mad Cave Studios is producing some great series, which you can purchase through comiXology or DriveThru Comics. I follow Mad Cave on Instagram to keep up with the release of Honor and Curse, but you can also find them on Twitter and Facebook.